Disclaimer: This article is a written account of my hands-on experiences with FCPX over the course of two weeks, and details what I have found whilst experimenting and using the program. What I've included isn't necessarily the only way to do things, and there will likely be things I don't know or have gotten wrong, there have been sections already re-written after checking if what I remembered was correct; so if you as a reader believe I have anything wrong, please let me know. And I hope you find my account of FCPX useful for anyone reading this. In June 2011, Apple released a new version of their popular Non-Linear Editor (NLE), Final Cut Pro. The new version 'Final Cut Pro X' (FCPX) was a huge change from past iterations, and in classic Apple fashion, they pretty much ditched support for old versions and said that FCPX was the way forward, and THE way to edit. From the outrage that came with this is, it appeared the vast majority of users thought Apple were wrong; I was one of these users. At the time I was 20 years old at University and prior to it's release was extremely excited for this new version with a slicker GUI, and the hope FCPX would make full use of whatever machine I was using: with it's 64-bit architecture, and background rendering. However upon seeing it's new features, and in some cases lack of features, and from reading other user's thoughts; I, like many others, became underwhelmed by this 'new way to edit'. FCPX was still from day one useable for professionals, it just wasn't a widely praised change, albeit with many seemingly needed features missing: such as multi screen support, lack of XML integration, EDL exports, and one of the biggest - no way to import FCP7 projects. Users essentially needed to re-train and learn this new way of thinking and find new ways to do things, but over time FCPX has become more accepted, with many additions unique to FCPX, that are better than other NLE's. FCP has still seemingly, lost it's place as a premium editor, with Adobe's Premiere quickly snapping up many users and post houses as their main system; with Avid often still sat at the head of the table. Many of the features added in the lastest version, 10.3, which many have described as more like FCP 11, are totally new to me personally as I jumped ship to Adobe's Premiere when I wanted to move on from FCP7, and have only now started to look back at FCPX as my next step; due to the Adobe CS6 package running terribly on my next machine, a 'Late 2015 iMac 5K'. Also I don't edit often enough, to fathom £30 or even £60 a month for Premiere CC, FCPX at £300 for a one off fee looks appealing in that sense. I already own and can use Avid but for most projects I do, it isn't an ideal platform. I chose to download the FCPX 30 day trial to edit a project with, and see how I liked it, this blog post is essentially a breakdown of how I worked, what I liked and disliked about FCPX, and if I think I'll move over. I think my situation is probably similar to many others, who edit occasionally at home and are looking for the most cost effective solution to work with; especially as students have just had their Adobe CC subscriptions almost doubled recently. The project I was going to edit would be the last of a series of Vlogs I was cutting for my girlfriend as she travelled around Asia for a few months, the previous episodes had all been cut using Premiere CS6; it worked but crashed a lot and I often lost work, and lost a lot of time waiting for Premiere to play catch up. FCPX's organisation is unlike any other NLE I've ever worked with, it took me a little time to get accustomed to it's unique style, it works with various levels of what I'd describe as 'Smart Organisation', and appears to want you to use these smart functions over conventional bins, I tried them but in the end stuck to the conventional way of things, I like simplicity when managing media for my own use. This manages all media and is the route of all projects, I treated this like an old fashioned 'Project File' and had any 'caches' for this project set to live within the 'Library'. My plan for future work, would be to open a new Library for each project I worked on. It would appear Apple have given you the option to use this how you please, but seemingly with the intention of enclosing all your media for every project within one library; I however don't believe it could handle this, and that feels messy to me, I like simple ways of working. This style of media management is almost like a merger of an Adobe Lightroom 'Library' and an Avid 'Database'. The file contains media metadata and is the key component to the location of your media outside of it's cache, but in essence doesn't contain much else, and many other programs contain this in the 'Project File' - however the FCPX library can also contain render media files, unlike an Avid database. Finally you need to tell the Library where to reside, I chose my External Work drive so it was on the same drive as the media it was referencing for this project (it made sense to me at the time), but if I was to move forward with FCPX as my main NLE I'd likely host Libraries on my boot drive, where I usually host my Premiere or Avid Project files, so it's on the same drive as the Program itself - I feel this would benefit the speed of the program (as it does Adobe's Lightroom), and also means it is backed up by Time Machine. These are similar to bins, and it looks like Apple's aim is to host media for projects within these; if you were to use one library for all projects etc. For the vlog edit, I used an Event for each day Siobhan and Emma shot footage, I essentially treated these like a Bin would be used in Avid, FCP7 or Premiere. This is the new name for what FCPX calls a 'Sequence'. Each of these can be housed inside an Event, which I did, and called that Event 'Sequences' as I would in any other NLE. This is the lowest level in FCPX media management, and is what you would make your exports from; like a sequence in any other NLE. You would use these after you apply keywords to your clips (if you decide to) and could then locate clips using their keywords; this isn't something I needed for the vlog edit, and would probably not ever use these personally. These are similar to Keyword Collections, but made from metadata that is relevant to the imported media, such as Camera, Resolution, Codec etc. There are default collections such as All Video, Audio Only, Stills and Favourites. These are not designed to be used as folders are used in FCP7, or other NLE's, or even folders in any OS ever; the reason they're called Folders eludes me. They appear to be solely used for housing Keyword Collections and Smart Collections only, so to me they were useless. The Browser can be displayed in probably the two most traditional ways: a List View and an Icon View. They both have their own merits but I often used the Icon View, whereas I'd usually use a List View, this was because it seemed quicker to sift footage and set in's and out's when in Icon View. The List View felt slower and the multiple thumbnails at the top when scrubbing was irritating to me. In a way the icon view's style of dragging a playhead to set a 'Range' (in and out points, to you and me) was useful for a Vlog as I often was dragging footage into a Project/Sequence roughly, to be fine-cut later, but when I wanted to be precise I felt it was a struggle as FCPX's scrubbing is connected to the cursor location primarily, and to the drag-able playhead secondarily, meaning I often changed my frame position without intending to. The icon view can be expanded to reveal filmstrips, to represent time periods ranging from 30minute increments down to 1/2 second increments; looks a lot like iMovie. There are also options for these views to contain waveforms for your media, and also 'Continuous Playback' which allows playback to follow on from one clip, when it is finished, to then start playing the next. Above you can also see there are read and green lines at the top of clip icons and this is down to using the 'Rejected' or 'Favourited' tags to help discard media visually. N.B. There is a workspace option for the Event Viewer to be next to your Timeline Viewer (like any other NLE - for example Avid's 'Source/Record', and FCP7's 'Viewer/Canvas') but I didn't see this until I was nearing the end of the project, it was however interesting to scrub media quickly in the icon view, and a good way to work for this kind of project. Whilst trying to organise the media for this last vlog, I tried to alter the date's of the clips that were incorrect, as I was trying to embrace the metadata way of doing things. This to me felt like how FCPX wanted me to use; but it threw it in my face. I quickly figured out you can't bulk-change multiple clips, with varying dates and times - to be unified to a single date and time. If I selected all clips I knew were to be part of 31st January, and these clips had a variety of creation dates, then FCPX will alter all the clips, by association, to the first clip in the list - if the first clip is changed forwards by 2 days, it changes the other clips forward by 2 days, NOT to the specific date you entered, meaning I needed to re-date clips in chunks if their original dates varied; so I didn't bother, and put clips in dated Events instead. Most of these features are useful but the option for creating Optimised and Proxy Media is excellent. This very simple, but very useful, feature is truly brilliant. It essentially creates ProRes media in the background to put all media on the same level playing field: 'Optimised Media' up's lower quality footage (such as H.264) to ProRes 422 to give a better editing experience, 'Proxy Media' creates ProRes Proxy media to improve playback for higher quality footage you struggle to run at full resolution (such as R3D, RAW or 4K). I found the background rendering to be very fast when I tested it, but I was running mostly 720p or 1080p media that was natively H264 files from an iPhone, and typically an average of 1-2 minutes a clip. The biggest advantage of this elegant feature is the removal of the conform process, gone are the days of keeping track of all media throughout an edit, and relinking your original media when you have locked your final offline sequence, and in worst case scenarios having to manually re-lay all media on a sequence with the high res native media. With two mouse clicks you can playback a full resolution edit, and be reconnected to your native media instantly - the Hollywood film 'Whisky Tango Foxtrot' found this feature very useful and is mentioned in this write up of their experience. My only gripe with this feature, is the lack of codec options, it looks like you can only have ProRes 422 for Optimised Media, and ProRes Proxy for Proxy Media, ProRes 422 is only 8-bit, so if you originally had 10-bit media you are losing three quarters of your colour space, unless you revert back to the native camera media before colouring and final output. If you need 10-bit and your system can handle ProRes HQ as your 'edit codec' then you should be allowed it as an option, but this is Apple's typical design of making decisions on behalf of the user assuming they know what you want, before you do; this isn't what pro users want or need, let us make the choice - EDIT June 19th, this information is incorrect, ProRes 422 is in fact a 10-bit codec, not 8-bit like I wrote here, I thought it was and have since been corrected; so this point is redundant, apologies for this. Lastly this is unlikely to ever happen but if DNxHD could be an option for this, that would make this feature even better, DNxHD36 is a truly fantastic codec for editing an offline, with DNxHD185X being a great finishing codec; also the DNxHD codec is far superior at retaining colour space information than ProRes is. Another nice elegant feature of FCPX's new UI is the addition of 'Roles', that seems to have been introduced in version 10.3. Roles allow an editor and/or an assistant to label media as a certain categories: Music, Dialogue, Character A, Character B, SFX, Atmos, VFX etc. These Roles, and Sub-Roles, can be customised to the point of title and even a visual colour, meaning when you glance at a timeline you can see what is what, simply by colour,. For example in the image above I have the Music coloured Red and all vlog footage coloured green; I could have gone more complex and coloured Siobhans footage Purple and Emma's Orange, so I could differentiate between then visually, but I didn't need to. A feature of Roles is the ability to 'Focus' on a certain role, such as Music, to then control just those elements. This is very useful for mass organisation and modification of the media, such as raising volume, adding an effect, altering EQ etc. Visually when you focus on a Role, the chosen Role stays the same size on the timeline, and the other roles all shrink to move out of the way (as seen in the above image). N.B, The Roles can be accessed through the timeline's Index tool, which is a way to view, Roles, Tags and Clips in a list order. FCPX, like most programs, is definitely not short of keyboard shortcuts, and I personally love a good keystroke to save time. I spent a lot of time at the start of using FCPX, building my own layout to fit how I like to work, and stripping out parts I wouldn't use. Something that took me some time was learning new terminology, Apple has decided to use new names in places down to the new timeline design, and this took some effort googling to find what function I was looking for and how to re-assign it to the key I wanted it to be. As I mostly use Avid on a day to day basis, the process of learning a new set of terms can be frustrating at first. Also I largely leave Avid's shortcuts to the stock setup, as I can often work between many machines with printed keyboards, always copying your preferences can be frustrating. Whereas in Premiere I use it solely at home and have a keyboard layout that is a hybrid of Avid, Adobe and FCP7, and the terminology is very similar to Avid. Strangely, Apple don't seem to have assigned images for the functions so nothing is easily understood from just the names given, however Logic Keyboards does offer a printed keyboard with the stock keys on it. Also Apple have swapped the Backspace and Delete keys from FCP7 (i'd imagine this has been different since 10.0 but it's news to me). I assume it's because Mac's by default ship with short Magic Keyboard's by standard so don't have a delete key, and the assumption is user's will want the delete function (ripple delete) over the backspace function (non-ripple delete). I'd argue leave backspace as it was and make shift+backspace or alt+backspace, the new 'Delete'. N.B. Lastly on this I have uploaded my FCPX layout here if anyone moving over from Avid or Premiere may find my alterations useful. FCPX's interface is limited in terms of customisation, it's more a series of options to turns items on or off, as apposed to total control. Above is the default workspace style for version 10.3, I used it differently to this with my browser on my left monitor, and the player, timeline and inspector on the right screen. I learned later on in my experience there were bigger audio meters available, and also a second viewer available for your Events, these are inside the 'WIndow > Show in Workspace' menu dropdown. These audio meters look like a posher version of the ones found in FCP7 and display Left and Right channels only, I can't find anything as advanced as the audio meters found in Avid or Premiere that allows multiple channels to be visible at once, and control different audio tracks independently - in FCPX it appears these would need to be adjusted on the timeline with the Inspector and key frames. Personally I think the interface is very nice looking and the dark grey Apple have chosen is very nice, and easy on the eyes too. The colour is not adjustable, as it is in Avid or Premiere, but is nice enough to not complain about; Larry Jordan has mentioned he had to make his edit suite a touch darker to fit the new UI's colour as the previous version of FCPX were a bit brighter. The UI's design is definitely easier to look at than some program's such as grading program 'Baselight', which uses a dark black background, and bright white text; which my eyes find offensive when using it for several hours, as the contrast is so strong - it can be headache inducing without the right ambient light. The interface is limited in terms of customisability, and you can't move panels to be in different configurations (such as Audio Meters on the left, Sidebar on the right etc) but it is very well laid out and not irritating to use. A program's GUI is incredibly important as bad design can very quickly put a user off, if items they want is hard to find or slow to use, people will quickly move on, if they can. I hate bad design and am often irritated by badly made UI's, or even just bad design in general. A trend I'm noticing is choices for UI's to be designed by software engineers who write the code and not graphic designers of even by people who are going to use it; this I feel is an increasing problem in video production with many UI's feeling like all options are thrown at the screen's real estate without care, and the wrong decisions made for items that should be simple to use. Apple has typically been known for well thought out UI's and arguably have created some of the must influential ones (albeit with potentially some theft for their first Mac OS GUI). They also arguably created the basis for most smartphone UI's with the icons being displayed in a uniform manner upon the opening screen, rather than squirrelled away in sub menus that feature phone's often did prior to the iPhone. FCPX's UI has the advantage whereby the creators have a limited number of machines that will run the program and so can design it to fit the screens it will be used on, and could in theory adjust for each model of Mac. For example I'm using it on a 5K iMac with a screen resolution of 5120x2880, whereas a Macbook Air has a resolution of 1440x900 so there's no need to push all the pixels needed for the 5k iMac onto the Macbook Air as it will be strenuous, so the UI is likely scaled down to fit. Designing a UI for all forms of computers and screen size could be much trickier and could lead to mixed results. There are many parts of FCPX's UI that feel very similar to the old FCP7, and also to Premiere, such as the mouse tools that are basically the same, with some minor alterations due to the changes to the overall UI. For example the 'Position' tool looks a lot like the general 'Select' tool and does the same job 90% of the time, except if you want to drag a clip to the end of a sequence. This is because FCPX, for some reason, have introduced 'Gap' or as it's known in Avid 'Filler'. This means you can't just drag clips around and create gaps between clips like you can in Premiere, FCP and Avid (well now anyway, sort of). This action now requires the 'Position' tool, or the clip will snap back to it's original position. The same happens if you attempt to drag a clip 'up a track' the Select tool will cause the clips after it to close the gap beneath the moved clip, and the position tool will fill the gap with 'gap'. I've seen the Position Tool being referred to as 'the backbone for users of other NLEs' and I can absolutely see good reason for this, I used it quite a lot, but I often like having chosen footage placed at the end of a sequence to then move into place as I see fit, and this isn't possible with just the Select Tool, it just won't work. There were many other functions in FCPX that were very useful when cutting a vlog, a big one was the speed changes I often do to footage Siobhan and Emma shot as timelapses. This was especially easy in FCPX as there are easy to reach functions for this, one option being below the viewer, it is a 'Retime Editor' who's icon looks like a 'speedometer'. The quickest way to 'fit a clip' into a certain space or time gap, is to highlight a clip on the timeline and press 'cmd+R', this brings up the 'Retime Menu' which gives you a percentage above the clip. You can now either use the dropdown to select a certain speed (50%, 25%, 2x, 4x) or a custom percentage. Or even faster, drag the right edges of the Retime Menu, as if you were trimming the clip and this will speed the clip up, or slow it down to fit the space used by it. Lastly about this, you can select different ways the retime will be rendered: Normal, Frame Blending or Optical Flow. For this project I just used Normal, I did try Optical Flow but I didn't see a difference and it took significantly more time to render. Another good feature in my eyes is the Text Tool which I personally think is the best Text Tool I've ever used in an NLE. The competition is pretty poor though with Avid's simplistic Title Tool, or it's clunky Marquee tool, Adobe's Title Tool is similar to the Avid one and too is a bit clunky (for CS6 on my iMac I can't change colour anymore), the FCP7 one was very simplistic and not very easy to adjust; but this one is fantastic. It has a similar style to the Avid and Premiere Title Tools, where you enter the text over the image, but instead of it being displayed in a separate window, this is directly onto the viewer, with all options displayed within the Inspector. The only reason to create more than one item on the timeline would be to control when each piece appears on screen. Within the tool you can have various lines of text in any font, size, drop shadow etc. I only used the tool various times to display when the video changes dates, and also to put on-screen captions. My only criticism of the title tool is finding it. This isn't necessarily because it's in a different place, as Titles in FCP7 were in the 'Effects Tab'. I think my issue is because everything else feels like it's very accessible, whereas this is a tiny tab on the left, and feels out of the way. What doesn't help is that most things that I would call an 'Effect': stabilisation, EQ, colour correction etc is in the inspector automatically when you highlight a clip, it just needs turning on. But Titles are the only thing in the Effects area that I would use often, the other things look like gimmicky iMovie items. I understand why the Titles are in there though, as this area shows a preview thumbnail of each style of Title: Lower Third, Credit Scroll, Star Wars Opening Text Effect, and each of these have playable previews; however 99% of these look like High Quality iMovie creations for photo montages and children home movies. The inspector is definitely an area of FCPX that you can't avoid and will be using regularly, whether that be to control your library properties, choose Colour Gamut (albeit with just two options, standard and wide), alter the properties of text, resize the scale of a video, and also implement many effects, such as Stabilisation, Audio EQ, removing hum, and colour matching. Many of the effects tools within Inspector require the footage to be analysed, but this can be started when footage is imported, it doesn't apply the 'fixes' there and then but it prepares the footage to be fixed if you require it later. I didn't find myself using these tools at all but given different circumstances I may have, I did try out the stabilisation to see how good it was, and it seemed to be as good as Premiere and After Effect's 'Warp Stabiliser' where I tried it but the footage wasn't ideal and often the image did warp a lot but this is to be expected when SIobhan and Emma both appear to have severe cases of 'Shaky Hand Syndrome'. In terms of the resizing and motion tools, these was very similar to FCP7 and Premiere's and were very easy to use, keyframes and such. I definitely don't think Avid user's will be confused by it, and if anything will be pleasantly surprised at it's ease in comparison to Avid's over-complication of simple tasks like this. I do however have to give a hand to the Inspector in it's ease of controlling volume of clips, you can highlight many clips at once (either through lassoing, or the Roles) and then alter the overall volume of these as a group, you could also add filters via this too such as the EQ or noise reducer. In editing there are many times you want, or need, to use a transition, on video and/or audio, and there are various reasons for this, the most common I find is to hide audio edits. I am in the camp that the only video transition needed is a dissolve, and at times a dip to black is necessary (this is more common place in montages and promotional material than a drama or feature film), and all the others are awful; I think only Star Wars has ever made good use of a wipe. In comparison you will likely find a heavy amount of audio transitions in many editor's sequence to hide their audio edits. In terms of video transitions they appear very similar to transitions in any other piece of software, however I found them to be often not what I wanted. For starters when you add a transition (cmd+T) to the end of a clip, sometimes the the clip gets thicker with a grey box appearing around it, as well as adding a transition symbol onto the clip's edge. After some research this is only when a clip is classed as a Secondary Storyline' and is then connected when a transition is applied to them. This to me, is just creating unnecessary clutter and bulk on the timeline; I'd argue the symbol is always enough on it's own. Also as this Secondary Storyline is it's own entity you need to drag it via the grey bar now, as the clips inside can be removed for it, but still leave the grey box behind, even if you delete all clips inside it. Also the default Cross Dissolve always seemed to be too harsh, with the first half barely changing and the second half changing quickly, this then requires the user to adjust each one to 'Ease In' or 'Ease Out' and then the percentage to 100% to get an effect that is a nice smooth change. These custom settings can't be saved permanently either, they would need to be dialled in every time you use a transition, this is a lot more work than 'Right Click > Add Default Transition'. On top of this to extend a clip with a transition on isn't as simple as rolling the end of the clip further out or in, I found I would have to double-click the transition to 'enter it' and then adjust inside there. If I wanted to alter where the transition starts in duration, I could drag the edge of the clip, but only at the top of the icon where there is two lines, apparently called 'Thumbs' which aren't easy to get at if you are zoomed out quite a way. In terms of transitioning audio, this is entirely non-existant. What I mean by this is, you can still ease audio in and out, but you can't use Transitions, you have to use a different toolset called 'Fades'. This is essentially the same tool that appears in FCP7, Avid and Premiere when you use keyframes directly on the timeline, but this being forced upon you may not be your ideal scenario. Personally I use transitions for audio all the time, Avid's 'Quick Transition' tool is probably my favourite implementation and works excellently for adding Transitions to multiple clips quickly; and controlling them with numbers and not dragging sides of something. On top of this, a fundamental part of a transition is it's use of handle's on your footage to build itself, a 'Fade' doesn't do this. The fade keyframes are always accessible when the audio is expanded, but If you apply fades to one or several clips, through the 'Modify' taskbar menu, it only fades the audio in and out within the original length of the clip, if you did this to every piece of audio, the audio would dip down and back up between each cut; not ideal, or discreet. To get around this you will need to drag out the media you wish to transition with, effectively making your own handles, and then fade it manually; the fade handles aren't the easiest to grab when zoomed out, so prepare for a lot of zooming in and out, when doing an audio pass. Also only having the one form of transition can be limiting, I often find a default audio transition a bit harsh if you are fading out music and will often use a standard transition to get me in the ballpark and then use a manual volume adjustment to finesse it, I can't do that in FCPX. 03 - After transition has been created manually, audio has been re-collapsed, and looks like this. This feature is likely one of the biggest innovations in recent history of NLE's, when announced it had mixed reviews with some loving it, and some hating it; and it isn't a feature you can chose to ignore, it's a fundamental core of the program, you either live with it or move to another NLE. It took me some time to get to grips with the magnetic aspect of the timeline, at first I found it frustrating and annoying, but once I'd come to accept it's way of working, I found it worked how I expected most of the time. It can often feel like someone keeps pressing keys and moving items without asking, like it's trying 'to assist you' constantly, and that can be extremely frustrating, but at times it's helpful and you do trust it to keep sync for you; sometimes too well. Because of how Apple have abolished 'Tracks', which every other NLE has, the clips need to contain themselves and keep sync somehow, and this is done by 'connections', which look like snorkels floating up from clips to ones above, and down from other clips to ones below. It personally feel's a bit pretentious as instead of tracks it creates 'storylines'; with your main one in the middle and the other clips, above and below, being 'secondary'. It also does simple things differently, like trimming a clip. If I 'roll' the start of a video clip (but not the audio) other programs will do one of two things, depending on the tool selected. Either, leave everything in the place it was, but the video is shorter with a gap left in it's place. Or the change would ripple down the timeline, and pull every clip, that follow the affected clip, up towards the edit; slipping the audio under, or overwriting, the audio before it. 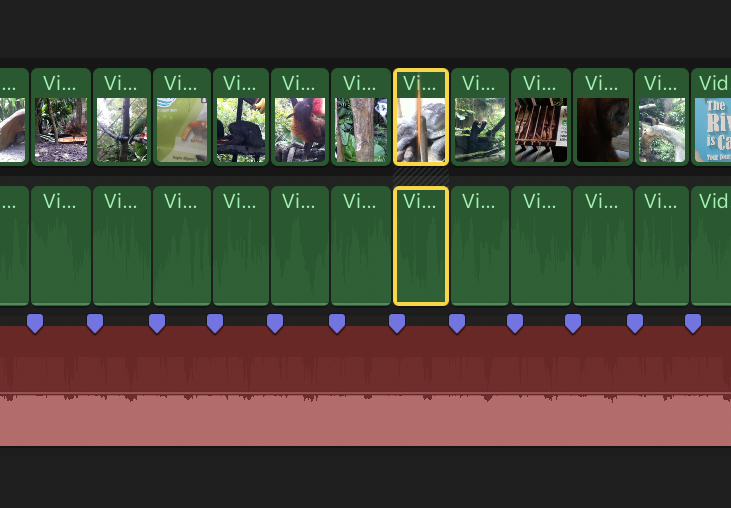 In FCPX it works the opposite, the clips prior to the edit move down the timeline instead, and if you undo the action, the clips after the prior-edit jump back down the timeline to sit at the right timecode. This at first looks crazy and is mildly confusing, but once you trust it has worked, you start to use it with a bit less suspicion. Another difference to FCPX's timeline is it's control of audio. By default the audio is 'collapsed' into the video and when you edit the video, the audio trims accordingly. If however you want to be more precise, making L and J cuts etc, you need to uncollapse the audio and then you can control the audio and video independently - this is similar to the 'Audio Selection Toggle' button in Avid, or un-linking/un-grouping audio in FCP7 or Premiere. I found myself constantly collapsing and un-collapsing my timeline (alt+A) to do J-cuts, which are a favourite of mine, and also often mandatory for a vlog, or a montage, to feel seamless. A way to control audio media permanently without the need for un-collapsing it, would be to detach it from the video, and they then become independent media, but be aware you cannot re-attach audio once you have disconnected them. Also another quirk is the lack of sync markers to warn you, if a shot slips out of sync with it's original audio; this is a worry for me and could potentially be a huge issue with an accidental slip of an edit - I feel the lack of sync markers is Apple's arrogance that as long as you edit how they suggest you do, it'll never go wrong, so why worry you with it. This appears to be very difficult also due to the requirement of 'gap', which as far as I'm aware is a main staple in most people's editing arsenal. FCPX allows you to put down in's and out's on the timeline but they have to be placed over existing media, or gap. This makes accurate 3-point edits feel difficult for anything other than replacing clips which can be done easier by dragging a new clip over an old one. 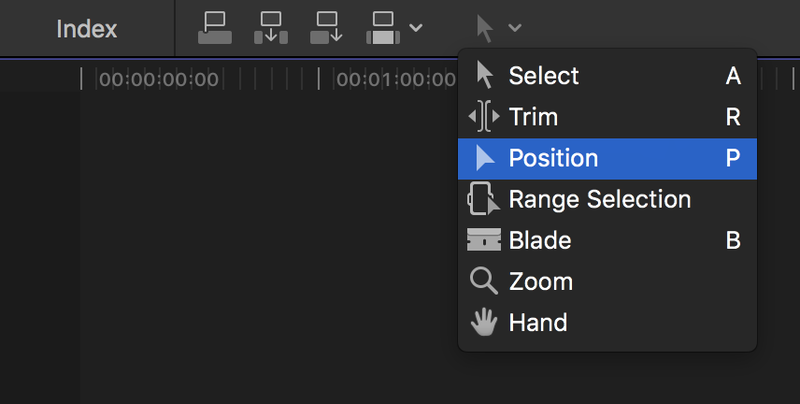 More and more I feel FCPX wants you to be throwing clips in roughly at first and finessing on the timeline, rather than being accurate from the start. A way around this would be to lay 'gap' at the end of your timeline at all times to allow some breathing space, this is however more of a work-around then a true problem solver; but I don't see this style of timeline changing anytime soon. In other NLE's, including FCPX's predecessor, scrubbing is done via dragging your playhead over clips, in your timeline or clip browser, this then partially plays the video and audio (if audio scrubbing is turned on) as you scrub through it. I use scrubbing a lot to review an edit, instead of playing it back properly, I find this helps a lot when you want a general over view of what you've done; it's also faster. Scrubbing in FCPX however, is done via the mouse cursor without having to drag a playhead, you get used to this quickly, but it means scrubbing is always 'on' in a way, you can turn it off with the toggle above the timeline but then you have nothing. Scrubbing this way is helpful in the clip browser as you can quickly review clips, but on the timeline it feels like it removes accuracy, so if you want to leave your playhead for a particular reason or place in's and out's it can be tricky; having to slowly move your cursor out of the timeline area for fear of losing your chosen frame. Also the audio scrubbing is near useless, as it plays the full audio, so it just sounds slowed down, rather than broken-audio playback like other NLE's which I feel is more useful. Personally I would like to have different scrubbing options between the timeline and the clip browser, as I feel you use them in different ways, partially because you can't scrub with a playhead in the browser, so the two being tied together isn't ideal. The main advantage of the magnetic timeline is the ability for it to re-order itself without it destructing other clips or being in the wrong order. This timeline's UI design is excellent for re-ordering montages, as I found out, because when you drag a clip from one side to another, the other clips in the same space move themselves around to fit into the gaps, it works really well. I didn't need to re-order the sequence in chunks, such as re-ordering scenes in a drama or feature, as I was cutting chronologically, but I have no doubt it would have coped. The caveat to this being you need to be sure your 'connections' are where you want them to be and you manage them properly, for example if 'clip 1' in your montage is connected to your music underneath, and you move clip 1 to the end of the clips - lets say clip 20 - your music will move with it. To stop this happening you'd need to un-collapse the audio, to allow true manipulation of your timeline. Another positive for the timeline is it's control of markers. These can appear on the base timeline as any other NLE, but also by just highlighting a clip, or music track, the markers then appear here instead, which is very helpful if marking up a music track for cut markers, if you plan to cut to the beat. However these markers do NOT transfer back to the source material and I'd therefore advise you do any 'beat markers' prior to laying it down. As a final positive note, markers placed on a clip, on the timeline are kept if you duplicate the clip or roll the clip's range back and forth, they aren't lost unless you want to delete them; and there's a whole dropdown menu for that. The newly designed 'Colour Board' is slightly hidden under the Enhancement option button in the timeline viewer, which requires you to click this option and then choose to 'Show Colour Board', this is a new design for the traditional '3-Way Colour Corrector'. Even though it's very attractively designed, it leaves very little to be desired, and is often seen as a mis-step in the software as a whole, given the range of features in other NLE's, including the older FCP7 which offered a variety of choices. The Colour Board does offers some basic options, such as adding tints, along with the usual saturation control, also the normal value control of blacks, mids and whites, and even a global exposure; but that is really it, so the options are lacking. There are many 'Instagram style' effects you can drop onto shots but for anyone wanting to colour match footage it going to struggle a bit - there also appears to be no way to apply a colour effect over the top of a sequence, like an adjustment layer in Adobe programs, or adding effects to filler in Avid. Luckily FCPX allows third party plugin's, and there are several you can choose from to better colour your work in here, including the suite from Magic Bullet that UI typically use but also a system called Colour Finale designed exclusively for FCPX and appears to offer far more functionality, like colour wheels, LUTs, curves, secondaries, and support for external hardware such as the Tangent colour wheels. In essence I feel there is a slight arrogance in it's way of thinking, it is an Apple product after all, as they have cut off any way of working other than this new way, and if you don't like it, then go elsewhere. Also the sloppiness with it's icons being random sizes is frustrating at times (dissolve's adding mass around a clip, text being thin unless it has a dissolve etc), but if you embrace the magnetic timeline, ignore any annoyances, accept you may have to be a bit rough at first when assembling, and mostly, you need to slow down at first and think more. Then you'll get to grips with it over time, and maybe learn to enjoy it...at least the up and down arrow keys still move between clips. In terms of performance and speed, I didn't find much issue with FCPX, it seemed to run fast, smoothly and efficiently with only maybe one crash. In perspective I am running a high end iMac (Late 2015 27", i7 4.0GHz, 512GB Flash storage, 4GB VRAM, 24GB RAM) and my media is coming through USB3.0 on a GTech 4TB drive, I'm not exactly struggling for raw power, so I'd expect most programs to run buttery smooth; Lightroom doesn't but I don't think it does for anyone. Also with FCPX being created by Apple, it should be designed to perform perfectly and use the full power of the iMac, which Premiere does not. The only times I noticed a hold up or an issue, was with switching between scrubbing my timeline, and scrubbing my media in the browser; there was always a wait of a second or two before it would play the browser, but the timeline was always instant. There was also the odd holdup if something on the timeline hadn't been rendered and there was a few layers of things, but this was rare; and is generally expected. FCPX does still render, as any NLE does, but how quickly and unnoticeably it does it, is what differs programs. Most programs now offer 'background rendering' which is advertised as if they don't render noticeably anymore, and will render while you still work, which isn't exactly true. FCPX, and others, render items in the program's 'down-time' when you aren't clicking buttons or pressing keys. You can dial in the time you want FCPX to wait before it starts to render i the preferences menu: 1 second, 5 seconds, 0.5 seconds etc. This ticking over every time you stop pressing button can often end in nothing rendering unless you go and make a cup of tea, as you are pretty much always pressing keys, and adjusting edits; so essentially it's not that different from previous software versions, other than you don't have a box over your UI anymore, stopping you from working. You can also force a render through the Modify dropdown menu, if you don't want to wait; it's progress can be checked through the 'Background Tasks' button in the top left of the main screen, which covers all tasks such as proxy media creation, rendering, waveform creation etc. One part of FCPX that did struggle at times, was waiting for waveform and poster frame creation. Waveform creation is often a problem and even though the task may look simple enough, it slows down all NLE's at one point or another. FCPX also makes a lot of poster frames and thumbnails constantly which can also be a struggle at times. This is down to FCPX making film strips along the timeline, and in the browser (if you expand clips to be film strip style) which displays different levels of detail depending on how zoomed in you are; this can take time. One way to reduce this time would be to change the view style to have no thumbnails (like Avid has), and this could be preferable to some; the option of just a 'header image' like in FCP7 isn't an option, so it's all or nothing. No thumbnails on the timeline could be preferable if you have a very long timeline, to reduce the load, but then you have very thin clip icons on the timeline, which may not be what you want. In a way I was using mixed media for this vlog, however my mix was only in resolution and frame rate, not codec; and even then my mix was only between 420p, 720p and 1080p footage, nothing more extreme like 4K, or god forbid 3D. I was also only using ProRes 422 LT media as I had transcoded it a long time before I got to the edit, if I had decided to do this edit in FCPX earlier on, I'd have utilised the 'Optimised Footage' upon import as a real test, or tried to cut with the native H264 media; that could have been fun. 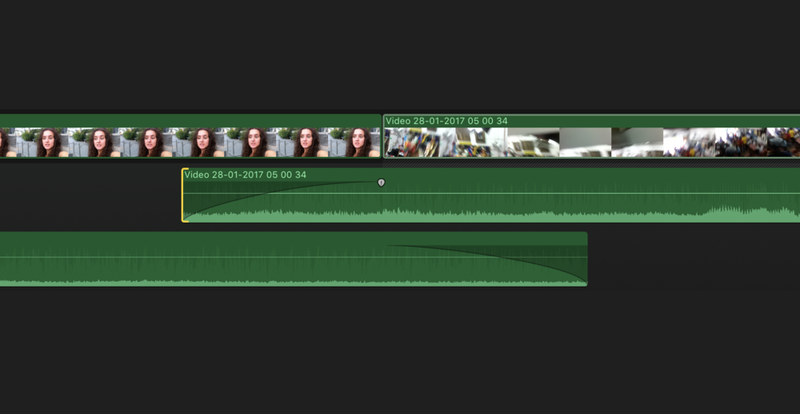 What I did find odd about cutting with the different resolutions was that when on a timeline the clips all appeared to be the same resolution. There wasn't the usual discrepancy of my timeline being set to 1280x720, with footage larger than that hanging off the edges and needing to be scaled down; FCPX seemed to on-the-fly, scale the 1080p footage down to fit, however it still displayed as 100% when in actually it should have appeared as around 67% as it had been scaled down already. The auto scaling down is welcomed, rather than me having to go through and check, as it isn't always obvious at first glance (especially when all the footage is pretty poor iPhone quality), but I'm a little dubious about how it does it when all footage appears at 100%, when really it shouldn't. Outside of what I was cutting, I'd imagine FCPX would handle mixed media well, mostly because of it's function to create optimised and proxy media upon import, but also because of it's impressive ability to cache and render on the fly as you work; this does come at a price. When normally cutting these vlogs, in Premiere CS6, I would be running with about 50% of my 24GB of RAM in use, with FCPX it was closer to 90% and sometimes more. This is likely down to the program's use of my full machine, and also the constant background rendering, waveform creation, poster frame creation and a more complex program in general. The rest of the machine however didn't suffer if I jumped to another program briefly such as: Finder to copy a file, Safari (often to google a simple function), or even Premiere (to check how I styled things in past videos). The options to export in FCPX are very limited, with next to no control. 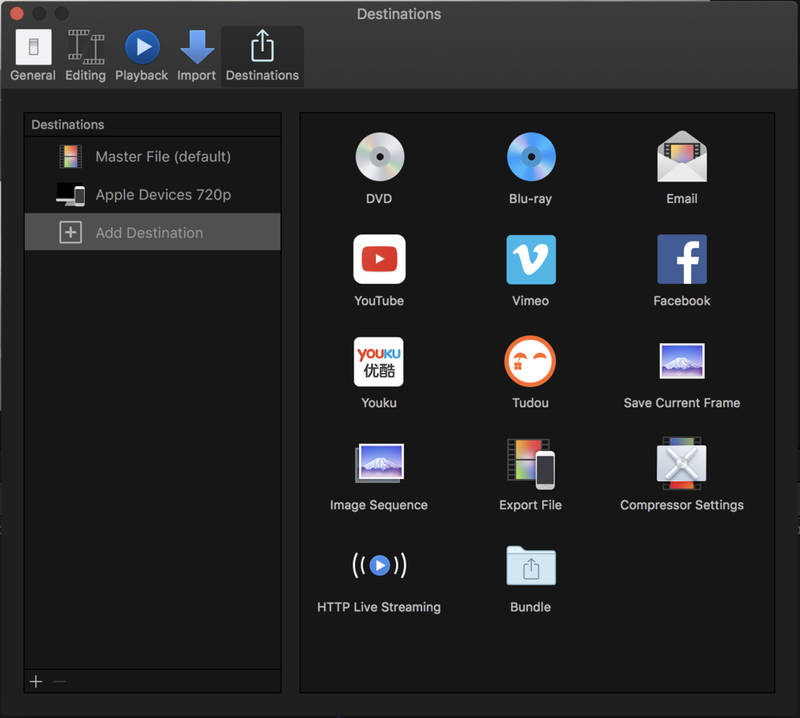 Apple has taken away a lot of the options to push you to exporting through Compressor (at a further £50), or use one of their presets for different Apple Devices, or even a DVD - good luck, given no Mac is sold with one now. The presets would be fine for review copies, but wasn't much use for me. I found it best to export as a 'Master File' which exports a clean feed using the same codec and resolution, as your video timeline. This then allows you to transcode it how you like in another program, I had a preset in Adobe Media Encoder for what I wanted, so sent my master file through that to transcode it to H264 for YouTube. In the past I've been quite against FCPX and not interested in 're-training' so to speak, but as I'm being pushed to my limit with CS6 I have to make a decision at some point, as to which NLE to move onto for projects I work on alone. In all honesty, I can see me using FCPX for these projects. There are definitely things I dislike about it, and would have to manage in a certain way to make it work for me, such as using Events as bins, but also colouring being one of these too, but currently I own a license for Red Giant's 'Magic Bullet Looks' and i'd be very interested at looking to buy Colour Finale in the future. A big positive for me is the retime editor, and how fast and easy-to-use it is, and I would honestly say FCPX comes across as the best program to cut timelapse videos in; which is a big bonus for me. I would still do initial file creation and colour in Lightroom and After Effects but move to FCPX for the final timelapse edit instead of Premiere. I can also imagine cutting montages and showreels in this would be a breeze, with the magnetic timeline helping me re-order clips with simplicity; and the excellent title tool. I think I'd still struggle for a while to cut drama or documentaries in it, but I don't see why I couldn't get to grips with it over time and make it work for me; in fairness I despised using Avid when I first started, now I can get my way round very quickly. I do still feel that FCPX isn't designed or appropriate, for the mass pro market though. And I don't see it ever replacing the staples that are Avid and Premiere; it doesn't handle multiple users and mass data banks with hard ware like Avid does, and it's lack of integration with After Effects amongst other programs, will be a drawback for many; such as small creative studios. But I do feel it has a place, with individuals, at both the pro level, and the prosumer/amateur level; the vlog I cut, and films like Focus and Whisky Tango Foxtrot prove it has scope for a range of projects. It does also have some fantastic features and is relatively cheap for what you get, Premiere alone would cost you £300 in 10 months, or in 5 months if you rented the full suite; and Avid is around £1200 for a permanent license, or over £500 a year for subscription. Yes, some of the toolset feels a bit gimmicky, and the initial management of media feels totally weird the first time, but you can get a lot out of it if you learn it; and there is plenty of tutorials and YouTube videos about how to use it. I would argue for anyone unsure about FCPX, but looking for an NLE option, to download the 30-day trial like I did and try it. But give it a go with a project to work on, maybe even re-cut a past project, or shoot a film specifically for this; if you just open it up to look around you won't learn enough. If you are getting to the bottom of this post, then I hope it has been helpful to you. If I do decide to purchase FCPX in the future then I very well may update this article with new findings. However if in that time you have any questions, or corrections for me, please do get in touch in the comments or on social media.